Watch the videos from the Institute’s Culminating Ceremony! You’re invited! Join us at the Institute’s Culminating Ceremony on August 6! Please join us for our sixth highly acclaimed Three-Day Institute on The World As It Could Be Human Rights Education Program curriculum. Click here for the Institute Flyer and Registration Form. Twenty-one hours of Continuing Education Credit or 2 CEUs are provided by the University of San Francisco for a cost of $100; details and registration here. There is no charge to attend if not seeking CEUs. The link to process the CEU request will be available in mid-June, 2015. 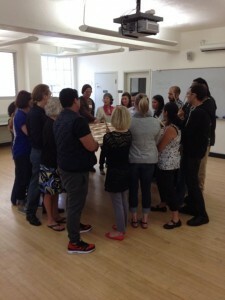 We are excited to hold the Institute at Balboa High School this year and have many teachers from the San Francisco Unified School District take part so as to deepen the impact of the curriculum across the District. And, of course, we welcome other Bay Area teachers! During the three-day training, participants gain knowledge about the Human Rights Education framework and the Universal Declaration of Human Rights (UDHR), and their importance in promoting the values, beliefs and attitudes that encourage all individuals to uphold their own rights and those of others. Participants will also experience using creative arts disciplines, including music, visual arts and performance arts to deepen understanding of human rights principles, as well as to express their own ideas of why and how these principles relate to addressing in a positive way the issues we face day-to-day in our schools and communities. The culminating, celebratory presentation of the students’ creative reflections on their studies of the UDHR provides a unique rite-of-passage experience that motivates both higher levels of academic engagement as well as enhanced awareness of and commitment to being engaged members of their immediate and broader communities.